I just ran across some pictures that a friend mailed to me back in 1985. Wow! That was 24 years ago! 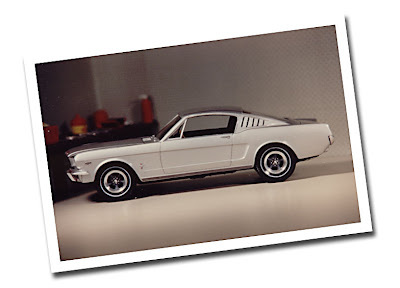 Anyway, he purchased a brand new 1965 Silver Smoke Grey Mustang Fastback in 1965. He added the American Torq-Thrust Wheels and Goodyear Blue Streaks shortly after he purchased the car. Anyway, it was a beautiful car. By the way, this is a photo of a model that he built years later of that very same car. Did you notice that it was not a real car?